As part of the launch of Le Méridien’s Au Soleil program, The Gathery designed and produced a poolside cocktail party inspired by lifestyle of the jet set. 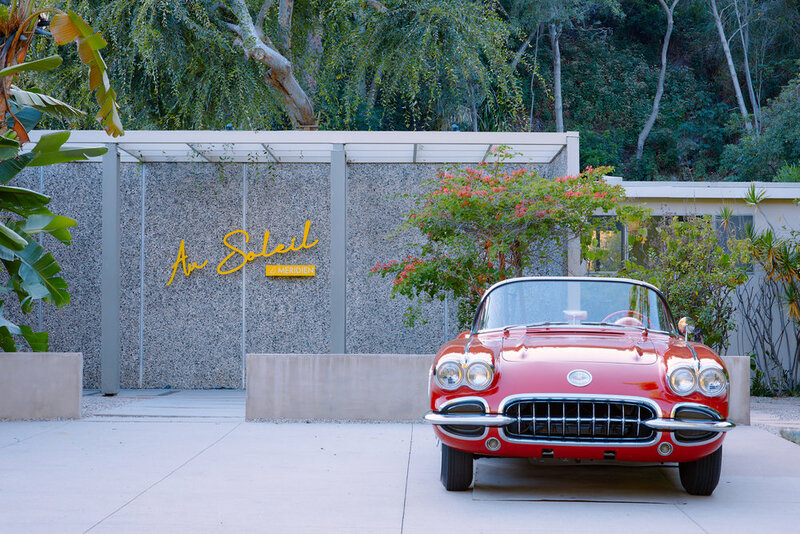 Reminiscent of the historic Slim Aaron’s photos of yesteryear, the event was held at a beautiful Hollywood Hills home with awe-inspiring views of Los Angeles. Upon arrival guests discovered a vintage car and the recognizable Au Soleil sign beckoning them to join the party. Our door bell, cleverly labeled ‘ring for rose’, set the whimsical tone of the evening. Guests were led to the lush garden where low lounge sitting, styled models playing backgammon, soothing tunes and our hostess, Garance Doré, invited them to linger. As the sun set over Los Angeles, Nouvelle Vague took the stage for an intimate set that included a special guest performance by jazz musician Chris Norton. The evening culminated in an impromptu dance party around the pool.